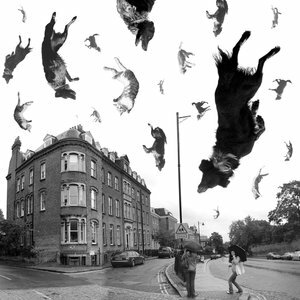 It has been raining very heavily for days without end in sight – so the old idiom “it is raining cats and dogs” came to my mind. It means just that: very heavy and persistent rain. “In school, from a book” he answered – so obviously the idiom is still widely enough used to make it into kids’ school books. The origin of the phrase is unknown and – as usual in some cases – a number of theories have been put forward. One explanation that has some credibility as there is a documented source is that in England of the 17th century sewage and drainage systems weren’t very efficient and so when heavy downpours happened the streets were turned into rivers of doubtful water quality carrying with it all sorts of things, including the corpses of drowned cats and dogs. This might or might not be the explanation but somehow it doesn’t matter. I just wish it would stop raining cats and dogs.